Once you have discovered why a problem occurs, you then need to find a permanent solution to the problem. In many cases, you don’t even need to analyze the root causes of a problem, you just need to solve the problem right away. These low hanging fruits may be quick wins or larger projects that may involve capital expenditure. For example, after reviewing a process, you may have identified non-value added activities that you want to reduce or eliminate. Other examples may include: modify a procedure, train employees, improve management reports, mistake proof a process, change workplace layout, and infrastructure initiatives. 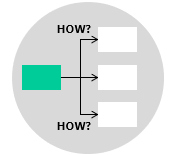 The How-How Diagram is used when seeking a practical solution to a problem. It works by repeatedly asking: ‘How can this be solved?‘. It provides an effective structure for organizing and sequencing possible options as well as the rewards and risks associated with each option. At each stage, there might be multiple answers to the ‘How’ questions, and the result is a hierarchical tree-structure. State the problem clearly then write it on a post-it card. Place it to the left of a large work area on the wall. Ask ‘How can this problem be solved?’. Let the team members write their answers on a post-it, then stick them up. Repeat this sequence of breaking down the problem once more. Keep asking “How” until you have no more answers or until you are satisfied with the improvement ideas. Prioritize then select the key and applicable solutions to implement. As an example, let’s say that we want to identify ways to reduce the amount of energy used. Identify ways to achieve the goal of reducing spoilage in a manufacturing business. It is similar to the 5 Why’s but a different question is asked (an adaptation of the root cause analysis). It is especially useful when creating or exploring a plan of action. It helps to break down the solution into more explicit elements. It shows a range of possible solutions all in one place.